While the Marine Life Park might appear almost complete in the last update, it seems that there is more work to be done. 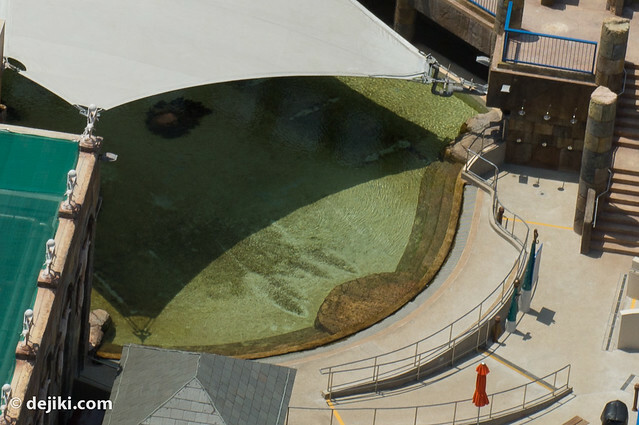 Most of the pools have been drained and many areas of the park are now accompanied with scaffolds. Compared to the beautiful views in the previous update, it’s does look a little shocking – almost like construction has regressed. Of course, this is only for the outdoor areas – there isn’t much see with what’s happening underground or inside the buildings. Let’s take a closer look at everything. 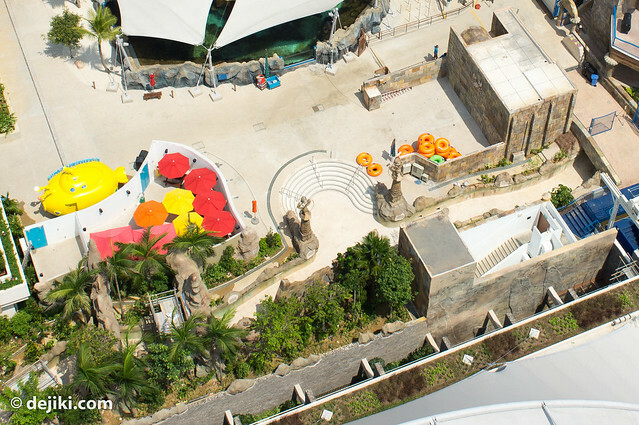 The reef swim attraction is still intact, and it’s actually called Rainbow Reef. Stone landscaping at one of the pools. They definitely need the pools to be dry for construction. Not sure what this area is really for yet, but do take note of the showers on the right. I finally have a nice shot of the overhead aquarium, or “tube” section of the Adventure River. 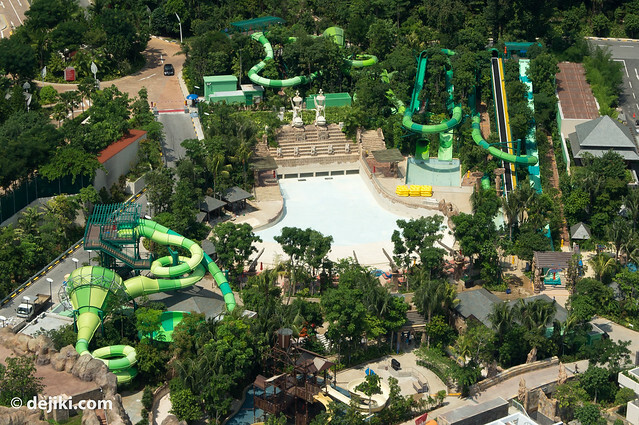 Even the Adventure Cove Waterpark area is dry. Perhaps the park is working on the water filtration system. Then again, it doesn’t make much sense to always keep the water in the park when it is not in operation. Some work is going on with the logs with swinging ropes. The fixtures on the log where ropes are connect have been taken apart. Some structural reinforcement, perhaps? 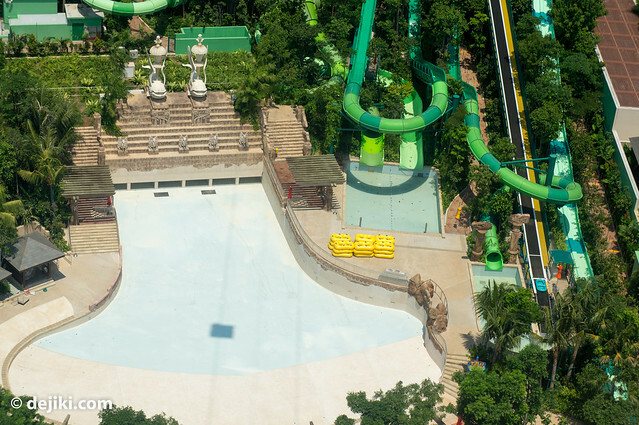 Here’s a view of the Adventure River, with some scaffolding at the bottom-left corner. Some work is going on at the waterfall archway. 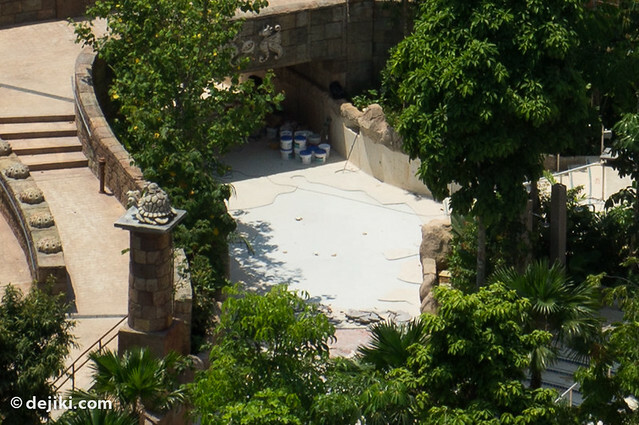 Some repair works at this section of the Adventure River: the flooring appears to have cracked, and is being ripped apart and redone. It looks like some of its residents are moving in. 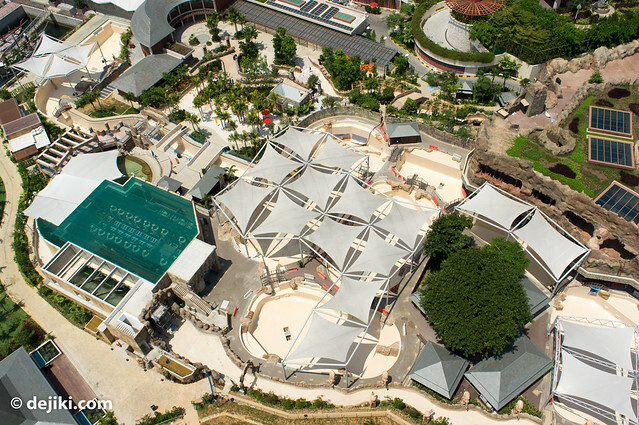 That is all for this update of Marine Life Park – from the air. 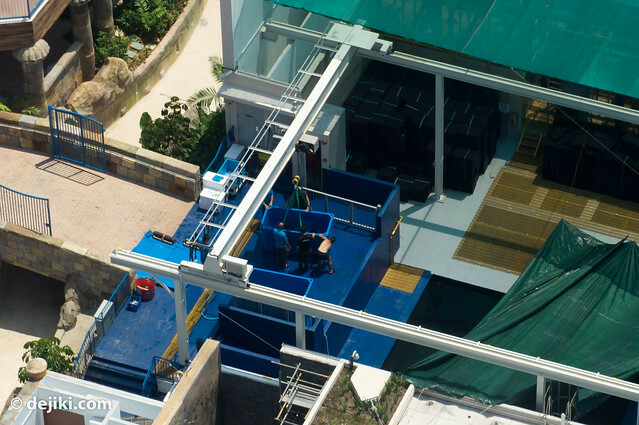 It looks like the park still needs work at certain areas, but the good news is that there is some activity in the main aquarium. 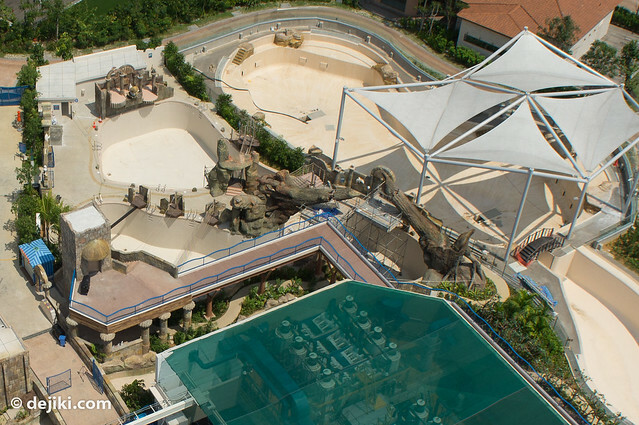 For those who have been keeping up with the local news, Marine Life Park is now expected to open by the end of 2012. 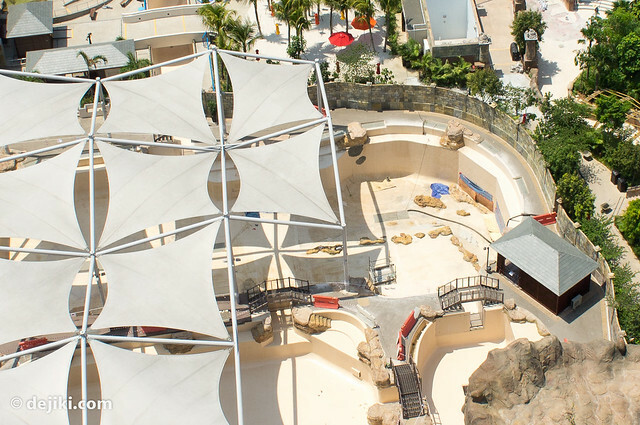 The park will be split into different areas, with the street level being the Dolphin Experience (interconnected pools) and Adventure Cover Waterpark. 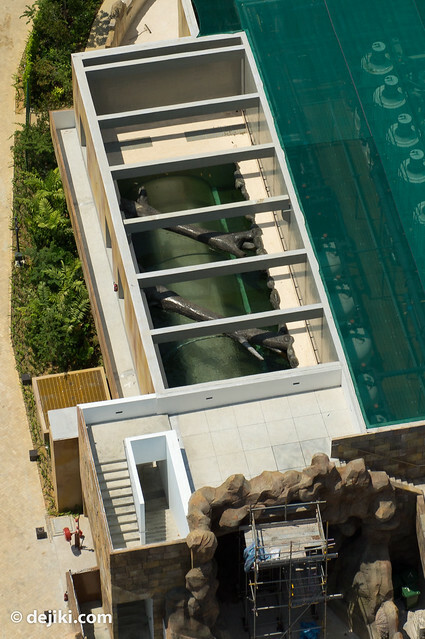 The Aquarium will be viewed underground, as originally designed in the park’s initial plans. Stay tuned (Subscribe!) for the next update in a couple of weeks! These are awesome aerial shots. Did you rent a helicopter or something? This is a nice new perspective of a marine park. Most of the time it’s all the inside and the marine animal photos. I am looking forward to spending my weekends there! Thanks for the update. 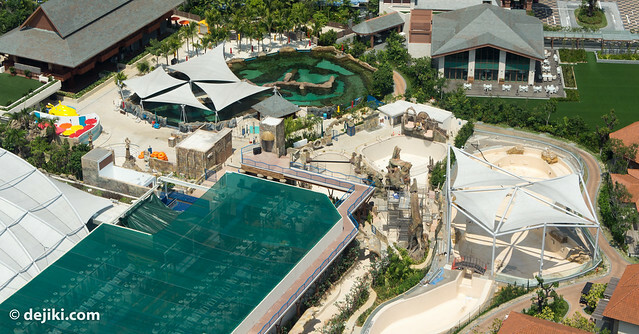 I’m surprised to see them re-doing the dolphin pools. But that’s Genting for you, they seem to be so fickle with plans. MLP’s concept and design has been changed umpteen times. 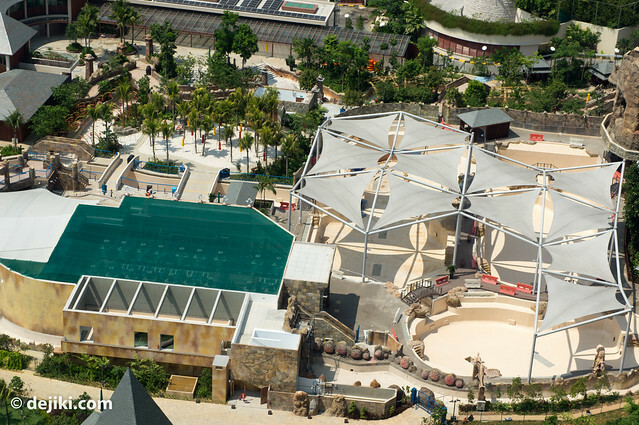 The pool with the showers in photo 6 could be the stingray swim experience. YAYYY PROGRESSSS! 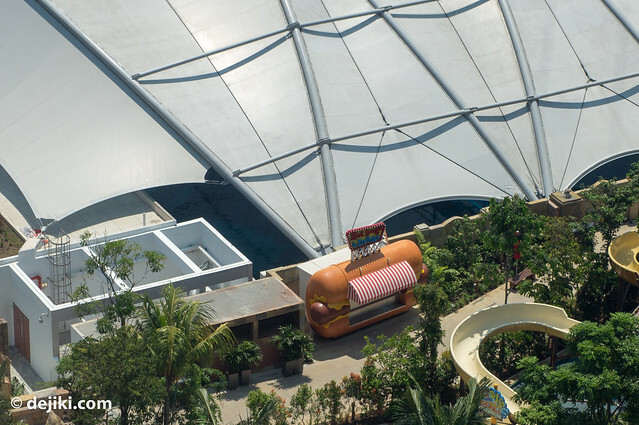 I wonder how many slides the park will have, I hope they’d beat the horrid ones (well they used to be good once upon a time) at Sunway Lagoon lol.